Senators Jay Rockefeller (D-West Virginia) and Frank Lautenberg (D-New Jersey) have introduced legislation that would require annual per capita reductions in driving each year. Another bill, the National Transportation Objectives Act, introduced by Representative Rush Holt (D-Indiana), Representative Russ Carnahan (D-Missouri) and Representative Jay Inslee (D-Washington.) would require a 16 percent reduction in driving in 20 years. Last week, a highly publicized report by the Urban Land Institute (Moving Cooler) also called for policies that would reduce the vehicle miles traveled (VMT) by people in their cars. This report was analyzed here by Alan Pisarski). The reductions in driving would be achieved by highly intrusive land use policies that would make it impossible for most Americans to live where they want, allow for only minor expansion of roadway capacity and force almost all new development to be within existing urban footprints. It would employ such radical strategies as forcing people to pay $400 per year to park their cars in front of their own homes. The assumption behind these initiatives is that reducing driving will produce substantial reductions in greenhouse gas emissions. It sounds like a simple enough proposition, since cars emit greenhouse gases in direct proportion to the gasoline they consume. It would seem logical that reducing their use would lower their emissions by a similar percentage. Moving Cooler assumes that for every 10 percent reduction in driving miles, there will be a 9 percent reduction in greenhouse gas emissions. Meager GHG Emission Reductions from Reducing Driving: But things are not nearly so simple. 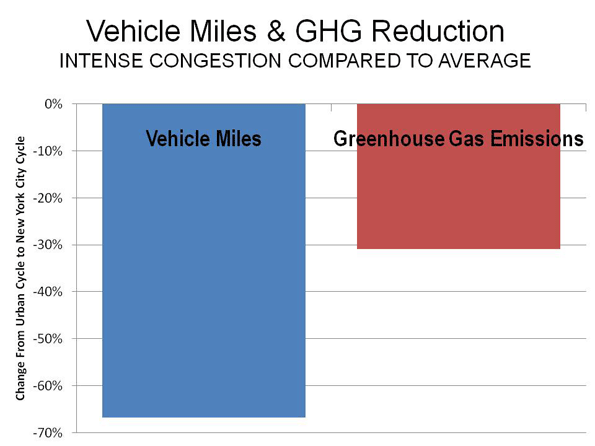 It appears that reducing vehicle miles would not produce a similar reduction in greenhouse gases from cars. It is well known that at the slower speeds of vehicle operation in cities, fuel economy tends to decline with speed. Further, as congestion increases, so does fuel consumption, due to longer idling periods (such as at signals or in stopped traffic), more acceleration and more deceleration. Thus, not only does fuel economy drop when average speeds drop, but it drops even further when traffic congestion intensifies. The extent to which any reduction in urban driving would reduce greenhouse gas emissions is not at all well known, simply because there has been insufficient research on the subject. Perhaps the best indication is a comparison of Environmental Protection Agency (EPA) “driving cycles,” which are tests used to estimate some emissions (although not greenhouse gases) and fuel economy. There is considerable data for the normal urban cycle, which replicates driving conditions in most of the nation’s urban areas. There is much less information available for the “New York City Cycle,” which replicates the congested traffic conditions in New York City, which is far more congested than any of the nation’s urban areas (Note). Under the New York City Cycle average speeds are two-thirds less than under the average urban cycle. This reduction in speed and increase in congestion results in a 50 percent loss in fuel economy, according to an Argonne National Laboratory Study. Thus, between New York City and the average urban area, fuel efficiency drops at a rate 80 percent of the lower driving rate in New York City. On average, vehicle travel in New York City is approximately 8 miles per capita daily. In the average large urban area outside New York City (such as the Phoenix urban area, or for that matter the suburbs of New York City), vehicle travel is approximately 24 miles per day per capita. Thus, per capita driving in New York City is 67 percent less than in Phoenix. However, because of the loss in fuel consumption, the greenhouse gas emissions from cars per capita is only 31 percent less (Figure 1). Thus, the limited data indicates that nearly one-half of the greenhouse gas emissions difference between New York City driving rates and Phoenix driving rates are cancelled out by the impacts of slower speeds and increased congestion. Especially in congested areas of California, VMT is an inadequate proxy for vehicle greenhouse gas emissions. Yet it is precisely more intense traffic congestion that we can expect if federal laws and policies should force most development into present urban footprints. Between 2010 and 2030, nearly 70,000,000 residents will be added to US urban areas, an increase of more than 25 percent. This increase would mean that the legislation introduced by Congressmen Hold, Carnahan and Inslee would require a one-third reduction in per capita driving to achieve its overall 16 percent reduction. Per capita driving declines such as those envisioned by the Congressmen or Moving Cooler have never occurred before in any American (or international) urban area. By comparison, charging people $400 to park their cars in front of their houses seems utterly reasonable. Further, higher population densities are associated with more intense traffic, both at the national and international level. Policies such as recommended by Moving Cooler would produce little additional highway capacity to handle the far higher levels of driving produced by a larger population. We could expect traffic congestion to increase markedly. It would take longer to get to work and local air pollution would be more intense (a health impact largely ignored by proponents of higher densities). In most cases, the shortest distance between a poor person and a job is along a line driven in a car. Prosperity in America has always been strongly related to mobility and poor people work hard for access to opportunities. For both the rural and inner-city poor, access means being able to reach the prosperous suburbs of our booming metropolitan economies, and mobility means having the private automobile necessary for the trip. The most important response to the policy challenge of job access for those leaving welfare is the continued and expanded use of cars by low-income workers. … policies which seek to reduce VMT may hinder economic growth without reducing emissions. The relationship between greater mobility and economic prosperity is also demonstrated at the national level. This is vividly illustrated in the chart from the United States Department of Energy (Figure 2). 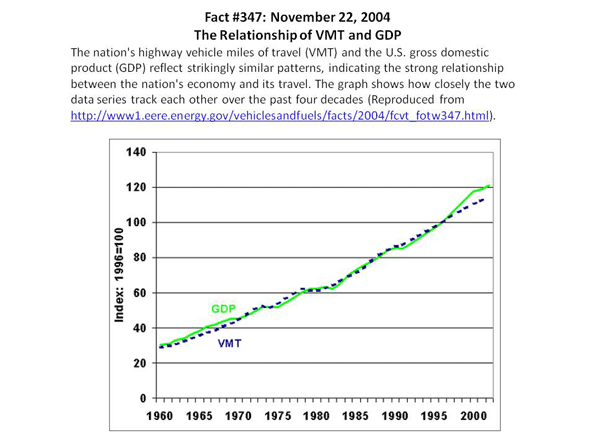 The significant improvements in fuel economy from higher mileage cars and less carbon intensive fuels will do far more to reduce greenhouse gas emissions from cars than the meager results that can be achieved by heavy handed policies to “coerce” people out of their cars (as Secretary of Transportation Ray LaHood put it). And, critically, it would do so with far less impact on both economic and physical mobility. Both the Economy and Greenhouse Gas Emissions at Stake: With the economic challenges facing the nation, policy makers need to steer clear of strategies that hobble the economy, like forcing people to drive less (or pay $400 to park in front of their houses) and make only minor improvements in reducing emissions. Indeed, a society with less money will have less to spend on reducing emissions through the adoption of new technologies that offer greater hope for creating a more prosperous as well as more environmentally sustainable society. Note: The New York City refers to the City of New York, not the metropolitan area or the urban area. Submitted by Rebecca Peterson on Sat, 05/02/2015 - 02:48. Submitted by Edwardparker on Tue, 04/07/2015 - 06:13. Due to large number of vehicles the environment is getting polluted day by day which impacts the greenhouse. 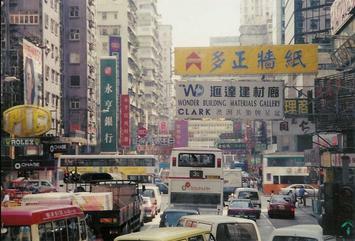 The air is highly polluted and affecting the ozone layer. Vehicles with bad maintenance emit more carbon dioxide which is harmful. Older vehicles should not be given license to run on road. It's better to keep your vehicle in a good condition and make the environment healthy. Always maintain a scheduled maintenance for your vehicle. Submitted by siya23 on Wed, 04/15/2015 - 01:05. Submitted by Amy Gilbert on Thu, 03/19/2015 - 07:30. Nowadays emission control is the important issues for countries and that’s why the vehicles manufactures are focusing on the production of best fuel efficient car that will lowers the emission and give a better fuel mileage, Indirectly helps to reduce the greenhouse effect. But except those steps you have mentioned i noticed some other reasons also caused lower fuel mileage and maximize emission, that points you can see here. Submitted by jeparaonline on Tue, 05/05/2015 - 09:38. Submitted by siya23 on Tue, 02/17/2015 - 07:21. Submitted by siya23 on Thu, 03/05/2015 - 02:52. Submitted by Jordan on Mon, 02/16/2015 - 05:13. The rate at which the number of vehicles are getting high on the road one thing is quite certain and that is the condition of society is getting more and more deteriorated. We are the one who is responsible for it and we are the one who will work well to get it into a better shape. We need to choose options like synthetic putting green so that the greenery on the earth can be increased. Submitted by siya23 on Mon, 05/25/2015 - 07:16. Submitted by luciakim619 on Fri, 07/04/2014 - 06:33. Green house effect is the most highlighted problem of these days that creating problem for people because it is the case that affecting the atmosphere as well as the human health too. From a survey it is found that the effective depletion in atmosphere found due to the various effects of carbon monoxide that mostly happening due to the increasing number of vehicle on road. I would like to say that better to prevent you vehicle from emission and that you can do at various service center.